Playing around with my iPhone 3GS I discovered that the mic portion of the headphone jack is active when video recording. If you have your iPhone headset, with built in microphone plugged in, the audio recorded is from the mic on the headset, not the one on the iPhone itself. That got me to thinking. It should be possible to put any audio signal, even a professional microphone signal, into the iPhone. I began to look for the wiring diagrams and such for the iPhone plug. Today, I ran across a post about using a standard AV cable from a camcorder. Plug the cable in, and the red RCA cable becomes the mono audio input. The other two RCAs may even pass audio signal back. So I tried it. Let me apologize for the lack of detail in the video. It exists because you have to record it when testing. Later I will create a more in depth look at how this works. You are looking at the back of a mixer that happened to have RCA record outputs. I plugged the red cable into one of those. Initially, the audio is from the mic on the iPhone, then I plug in the cable and, the music is recorded. Very short, very simple, but sort of a proof of concept. The audio level is very hot in the recording. The iPhone mic is looking for a mic level input, and the signal I was sending was at line level. Even pulling the level way back, I am on the edge of distortion. I tried using the meter on the voice memo app to set levels, but the difference was too great. This signal on that meter showed to be well below distortion. But as you can hear, it was red lining in the camera app. But, the experiment brought me one more step closer to an XLR input for the iPhone. It should be able to handle a normal mic level input. Now I know that an AV cable can be rewired to serve as the plug for the mic input. Now to work on a transformer for a balanced audio signal to an unbalanced one. Recently, AT&T changed their smartphone data plans to a tiered, capped structure. There’s a plan for under 200MB usage in a month, and for up to 2GB usage, with additional steps for each extra 1GB of usage. I went to check my data usage, sure i was up close to the 2GB limit, and discovered that I was not even breaking the 200MB limit. I use wifi all the time. I am almost always in a wifi hotspot when I do any sort of lengthy data use on my iPhone. Since all current iPhone users are “grandfathered” into their current plans, I don’t have to switch. But if I never hit 200MB, I could be saving that extra money every month. But how much data do I actually use? If my wifi went down one month, how much would I use? So, I decided to test it out, I turned off wifi on my phone. I have discovered that I really miss the speed of wifi. I know that 3G is faster than edge (believe me, I know), but man 3G is not fast. not really, not compared to a good wifi connection. No wonder I developed a habit of using data on wifi. Who wouldn’t if it’s available. Plus, iTunes won’t let you download larger applications over wifi, so some updates have to be done with the computer. Since I have been using an iPad, I don’t normally take my laptop home anymore. So I have to wait to get the apps or updates. Speaking of the iPad. If it is available, and the 3G connection is slow, or even worse, I’m on Edge, I will confess to grabbing the wifi ipad to do a task rather than wait for 3G. So my experiment is tainted. it is also tainted because on occasion, I have needed data in a hurry, and switched to wifi on the phone. Only for a minute, only for a few MBs. To be honest, I’m thinking about forgoing the experiment altogether. Now that iOS4 is here, with multitasking, I may end up skewing the whole thing by streaming music with Pandora on the road. I don’t know what will happen. 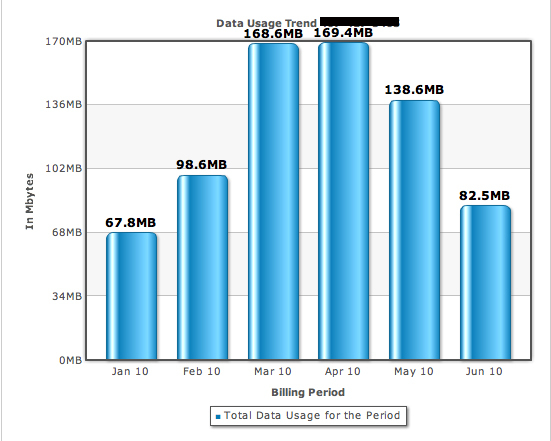 or how my usage will change, which is why I am planning to keep my unlimited plan, for a while anyway. There is a reason these phones are designed with wifi capability. It’s a better connection than 3G. Maybe I’ll just do it for half a month? How much longer is that? Another week or so? I am typing this on my iPhone running iOS4, while streaming music in the background. The upgrade process went smoothly. Download, update and then iTunes automatically installed my files. The interface seems quick on my 3GS. I selected a wallpaper for my home screen. Then I made some folders. By using folders I dropped from 5 screens of apps down to 3. There is a maximum of 12 apps per folder. I actually have 2 games folders. I downloaded iBooks and synced my books and bookmarks. Seamless process so far. But, I think that when I read some on my iPhone and then pick up the iPad, unless I have synced them since, the bookmarks will not be in the same place. I don’t think they will sync wirelessly. Multiple tasking is cool. Can’t wait to get a new version of my Navigon software. Of course, apps have to be optimized for iOS4 to really use it, but it works pretty well so far. Double tap the home button to see what is open. Touch and hold to enter the “quit app” mode. The nested replies in email surprised me. It was automatic. My exchange account is very much like my gmail account now. Not too bad. You can definitely see the pixels, but hey, it’s digital zoom. Overall it has been an easy transition to the new OS. Like it so far. 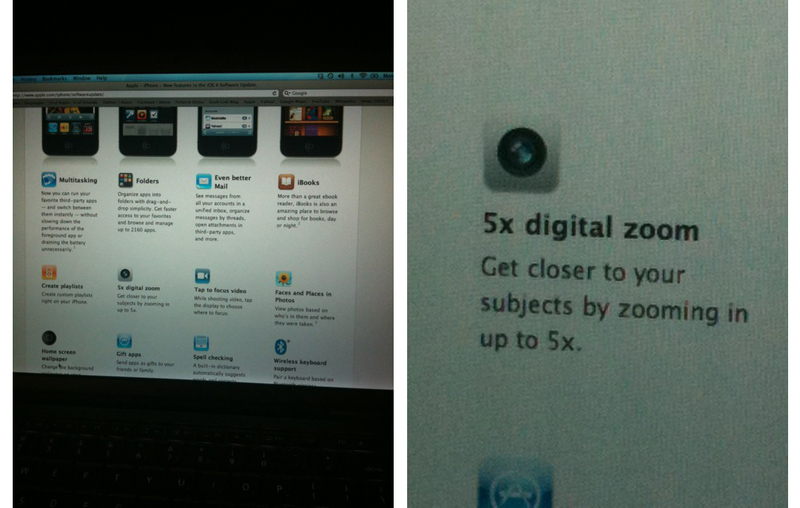 iPod Update: I upgraded my 8GB iPod Touch, a version from a couple years ago. No multitasking ability. But folders work great. Is it silly to be this happy about an OS update? Maybe, but I still am. Can’t wait to try out the new features. 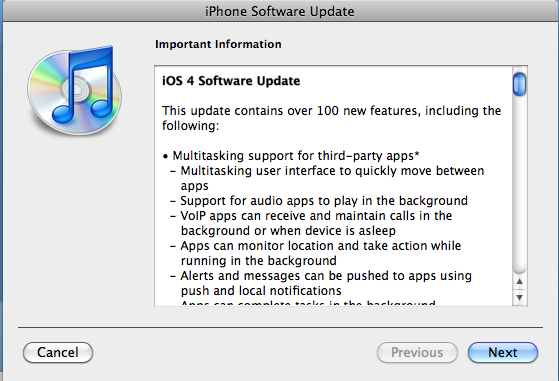 I just checked to see if iOS4 was available. It’s not. According to some, last time the new software released early afternoon EST, which makes sense for the West Coast based Apple. I am going to take the plunge immediately. I know prudence says to wait and make sure the process works, but some people have to be the test subjects. So, as soon as I can get it I will install it. Quick review to follow install. Macworld posted an article reporting that 600,000 preorders were taken for the iPhone 4 yesterday. Expect to see iPhone 4 models selling on eBay for triple retail very soon. Some are claiming the demand is 10 times higher than for the 3Gs. This demand is surely what caused the host of issues that precipitated the apology from Apple. Which Will Impact the World More? Right now the Southern Baptist Convention is debating how we, as a denomination, go forward into the world with the Gospel of Jesus Christ. Do we keep our approach the same, and revitalize it somehow, or change it up? Apple cannot even keep up (or rather AT&T cannot) with the orders pouring in for the new iteration of their amazing device. The processing power, new display, and video technology will change how people communicate and compute. Apple is very good at telling people they need the newest piece of technology they create. People do not actually need an iPhone. But millions think they must have one. I own one, and like it a lot. But using an iPhone is not required to live on earth. The SBC is talking about something of eternal significance right now. Will what is decided today truly change the world? Or will it be revealed at rhetoric and political maneuvering? I know many people, on both “sides” who truly want what is best for the denomination, and to see us impact the world. I know that we cannot expect the decline of Christian faith in western society to reverse course by simply doing what we have always done. I hope that the outcome of today pleases God. I hope that the work done today really does impact the world, and eternity. I hope that from today we will work to become just as good as Apple, or any other group or organization, at helping people see the need in their lives. To be sure, what we offer is so much more important than the new iPhone. I hope that our actions today reflect that. With the announcement of iMovie for iPhone, and then subsequent announcement that it would only work on the iphone 4, made me wonder what options existed for iPhone 3Gs owners like me. I would love to be able to edit video on my phone. Mainly so I can do quick videos to post online. After a litle bit of research I came up with Reel Director from nexvio. It’s no Final Cut Pro, or even iMovie, but it does allow you to string clips together, edit for length, add transitions, titles and even a sound track for $3.99. You cannot use audio from your iTunes library, but must upload them from your computer. Photos can be animated with the Ken Burns effect. No real preview. You have to render it all to see and hear how your video really plays, and the render time isn’t quick. But you can edit video on your phone. After yesterday’s keynote from Steve Jobs many are eagerly awaiting June 24. The iPhone 4 is a great device, one that lots of people are going to get. A phone that records the same quality video as the Flip Ultra HD, and for $5 can edit that same video on that device, is enough to almost push me over the edge. Almost. I like my 3Gs. In order to get it I had to rework my contract with AT&T, and now I don’t get to upgrade until February 2011. But never fear, AT&T has released it’s pricing for poor guys like me who are not ready to upgrade. TUAW reports that the cost to early upgrade with a new 2 year contract is $399 for a 16GB and $499 for a 32GB. Add $200 to that price if you don’t want to extend your contract. That’s a lot of money. But let’s say you don’t want to wait… What then? If there’s a line on your account that is eligible for upgrade you can upgrade that one and then swap the equipment to your line. Bear in mind that both lines will be locked into a new 2 year contract, and will have to wait at least 18 months to upgrade again (with special pricing anyway). You can also sell your current iPhone. When the 3Gs came out, I sold my 3G on eBay for $400. It wasn’t jailbroken, it was just an iPhone without a contract. I would not even ship overseas. If you could sell your 3Gs for that, the new iPhone 4 16GB would be covered. Currently, 3Gs iPhones without contracts are selling between $300 and $600, depending on condition, memory size and other factors. If you go this route, beware of scams. The iPhone is a highly sought after device and you will probably get an email asking you to do something for a sale, something that could set you up to get ripped off. Just remember that eBay and Paypal are designed to protect the buyer first. Take precautions and then don’t bend the rules. When I sold my iPhone 3G I was requiring Paypal immediate payment, and only shippng to the USA, to verified Paypal addresses. I got an offer from a buyer that seemed legit on the surface. The buyer from New York would pay me through his account, but would I please ship the phone to his brother in the Phillipines for a birthday present. Simple enough. Unless you know how Paypal works. I get the money from the buyer. I ship to the Phillipines where the package cannot be tracked, and as soon as the phone arrives he opens a dispute with Paypal claiming I never shipped it. Without package tracking I cannot prove I did. Because of Paypal’s rules, he wins the dispute. I’m out phone and the money. I did not sell to that guy. I told him he could pay for overnight shipping to his Paypal confirmed address, then he could ship to his brother. I never heard from him again. Be careful if you do sell your current phone on eBay. Done right, you could make enough to cover the early upgrade pricing for the iPhone 4. I am still thinking about whether I want to go this route. The iPhone 4 is tempting. But of the iMovie app can work on an iPad or my 3Gs, I will probably wait. Recently I found myself in a conversation about meetings. It started with a question about how many do I attend in a week, and ended with talk about what makes a meeting worthwhile, what makes it a good use of time versus a waste of time. During the exchange, I saw a couple of different approaches to what meetings can be. Is a meeting just a time to disseminate information, or is it a time to wrestle with tough issues, and collaborate on solutions to challenges? One is sort of a traditional way to delegate and communicate, where the boss tells the subordinates what they should know and what they should do. The other can create a climate for a team to work together. Both kinds of meetings should probably happen in most organizations, and should definitely happen in ministries. Apparently Apple operates in a sort of knowledge-is-power, transparency-breeds-trust, change-needs-champions kind of way. (I mean those in the best way possible.) In that climate, every employee knows the vision, and feels like a part of the solution. I doubt anyone was left out, sitting around wondering why the iPhone 4 had a front facing camera. It’s team work, and in a company that is focused on innovating new technology it’s a critical part of their success. There are pitfalls. Someone has to be in charge, has to be casting vision. Everyone has to participate. This kind of thing can degenerate quickly. If the moderator isn’t prepared the meeting will be a waste of time. Keeping groups of people focused is a skill that many lack. Enter the meeting with clear goals in mind. I realize that this kind of meeting is something that creative people gravitate toward. People who work in more ‘hard’ disciplines will probably want more form in their meetings. Recently I was in an impromptu meeting with a staff member from my area, and in walked someone from a different ministry area. We all three met briefly. It wasn’t a scheduled meeting, we had no agenda, but quickly worked through some issues. As he left, the newcomer commented that he had never seen one of his staff members put their feet up on the desk during one of his meetings. He was not angry or critical, just pointing out a difference in demeanor between meetings he holds and what we had just experienced. I had not even noticed my team member’s feet were propped up. I am glad we have the kind of relationship where we can be comfortable working through hard issues. My approach to teamwork lends itself toward informality rather than formality. In a more diverse organization, the other approach is sometimes required. We all need to be aware of the direction and vision of leadership. In a church, hearing from the pastor is critical as other ministry areas make plans and prepare their programs. If God is telling the leadership to move in one direction with the church’s resources, we all need to be adjusting toward that direction. The caution here is that too much of this kind of meeting results in a team that feels no ownership of the process, of the ministry. Anyone can see the difference in a team that was told to do something versus being allowed to collaborate on what should be done. The difference in energy, morale, and satisfaction between the two is palpable. There are some things that require singular focus and direction, and collaboration will not help. But there are times when working together can produce maximum results. The key is to be able to recognize which is which. Every week I attend a meeting where I am told what is happening on a large scale. Every week I have meetings where teams come together and figure out how we are going to accomplish the goals before us. Every week I am told some things we are going to do. Every week I gather with small groups of people to work through challenges, and chart a course of action. Finding the balance between those is hard, but required in order to execute with excellence.